Product Condition: The Canyonlands 1/2-Zip Pullover Fleece Jacket - Men's is in Excellent condition. This Canyonlands North Face Fleece jacket was owned for about a month and is in great condition. The jacket was returned without tags, and has a noticeable perfume smell. However, aside from these two things, this jacket is in great condition and has no other physical defects. Boulderers rejoice! 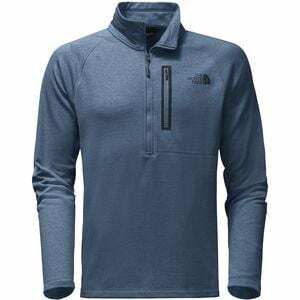 The North Face Men's Canyonlands 1/2-Zip Pullover Jacket is here to keep you nice and cozy while you blow the mantle over and over in cold conditions. This polyester hardface fleece is durable on the outside and soft on the inside to keep you insulated without overheating whether you're landing on crash pads or spotting your friends. When the snow flies, throw a hardshell on over the Canyonlands and take it to the resort to stay toasty while you chase powder. Before you know it, it'll be spring and time to send your favorite problems all over again.